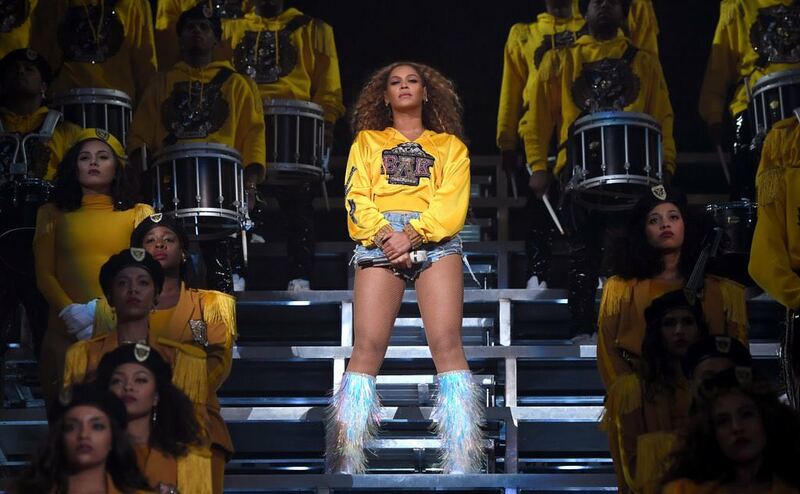 Queen B took over the Coachella music festival late Saturday night and gave the massive crowd an HBCU style collegiate experience which included her own HBCU style marching band. To put it bluntly, this may be the single greatest use of a marching band in a performance that doesn't include a football field. Many artists have attempted to use bands like this, the majority just use drumlines, but only Beyonce could pull off a 125 member marching band which remained on stage with her for a huge chunk of her show playing new arrangements of some of her biggest hits with extensive choreography and a fantastic sound. Fans of HBCU marching bands nearly lost their minds, but the big questions has yet to be solved. Who was in this marching band? From what we can tell this is not one marching band from one school, but instead a collection of HBCU band alumni and maybe current members as well as professional performers who have been secretly coming together to get ready for this performance. We noticed that one member of the drumline was wearing a North Carolina A&T sweat shirt and the whole theme of the band's outfit seemed to be inspired by the Blue & Gold Marching Machine. More importantly this performance was a monumental moment for marching bands especially those in the HBCU community. The world's biggest music icon took the most iconic piece of an HBCU school and showcased to the world how special it truly is. This was the first time a black female artist headlined Coachella and it may go down as her biggest and best performance ever. A generation of young musicians will watch last night's performance and now dream of being in a college marching band, many an HBCU marching band. That's what a moment like this does. It brings acceptance. It inspires. It changes the path of young people. And no one other than Beyonce could have pulled this off.